It's here! It's online! The Crystal Silence League Prayer Request site is now up and running. Thank you St. Jude, for answering all my prayers! Thank you, witchy_woman. The Crystal Silence League had its beginning in the early 20th century and at that time all of the prayers were conveyed via postal mail. Those of us who have helped the CSL to transition into the 21st century (Deacon Millett of Four Altars Gospel Sanctuary in the California High Desert, Brother Jeffrey Vanderson of the House of Prophecy Spiritual Church in Birmingham, AL, and myself) are extremely pleased to see how the internet enhances the structure of this prayer chain. In particular, we wish to thank Oran Davis for his part in the development of the Crystal Silence League web site. Oran is a former Lucky Mojo Curio Co. employee who worked in our Forestville lab, hand-crafting our spiritual oils, bath crystals, incense powders, and sachet powders, all the while attending college to learn high-tech computer programming skills. He has recently taken flight as a fully-fledged computer specialist -- and we could not be more pleased with the job he did for the Missionary Independent Spiritual Churches, creating the wonderfully interactive CSL web site, where people's prayers can be seen and downloaded by those who wish to work with a crystal to magnify their petitions to Spirit. Oran will be working on other projects for the Missionary Independent Spiritual Churches in the weeks to come. Look for more great additions to our functionality! I'm so glad to see this thread. I've been referring my clients to the Crystal Silence League to reinforce our work together. I am a member myself, with my very own "crystal set" and use it on behalf of others every day. I am extremely excited about this tremendous resource. I would encourage anyone who has a need or concern (or knows someone who does) to share their burden with us. Through unity in prayer we can uplift and overcome! Thank you Brother Vanderson, Miss Cat any and all helpful Members for The Crystal Silence League and the workings of all. I too would like to extend my thanks, and say how much I like the new site! It is extremely heartening to see the notifications of others praying for you. I recently posted a need, and my situation has been terribly stressful and at times so depressing that tears were close at hand. Logging in to my email and seeing notices from people who are helping to lift my burden up has been a lifesaver, and has inspired me to join in and pray for those who are burdened. this is beautiful and i really thank everyone for their hard work and dedication to this project! i absolutely love this idea and now want to get my own crystal ball to pray for others as well!!! Agreed, this is beneficial for everyone involved. I've never used a crystal ball to pray, do you simply put it over the paper and pray as usual, or is there a visualization of some kind that goes with it? just wanted to extend my appreciation to the church for developing the Crystal Silence League site and to all those that have contributed to its workings. thank you also for praying for myself and my room mates, so that we might find suitable housing by sept 1st. with the help of these prayers, i have hope that our application for the N. Minter home will be chosen!! the feeling of peace that i received is overwhelming and beautiful, so thank you all once again! The crystal ball is an extremely versatile tool for prayer. Those who join the CSL receive a book that describes different ways to use one. You can also check out and subscribe to the CSL Newsletter Archive to get some ideas about how to use a crystal ball. A simple technique for praying for people on the CSL prayer wall is to have that person or prayer request in mind, focus your awareness on the crystal and visualize or imagine a pure white light beaming out from the crystal towards the person in need. Hold that visualization for a few moments or as longs as your comfortable. Afterwards, you can finish with an "Amen" or "So may it be." Thanks for that, Brother Vanderson. Just emailed to start the book order process. And the prices on the crystal balls are really nice, I can't justify getting another one just now but I'll definitely get my next one there! I joined the CSL yesterday, and today posted a prayer request. I browsed through and found two people with similar prayer requests and prayed for them immediately. Minutes after I prayed I got a sign! It wasn't a big sign but it was a very fast sign. Thank you all for reviving the CSL and sharing the good prayer energy!! I absolutely LOVE the Crystal Silence League and how it is being handled by such capable people! I feel honored and blessed to have been under that tent at Missionary Independent Spiritual Church for the first meeting of the CSL! A beautiful time! "Though I have been doing the nightly 'sending' crystal meditation/prayers for others, I had yet to do the morning 'receiving' crystal meditation/prayer for myself. Until Monday morning that is...and WOW did it hit me! I was filled with a great sense of purpose and direction specifically concerning my near future! I immediately started turning those thoughts into actions. I am a true believer, now more than ever. I am so happy and grateful for the re-emergence of the Crystal Silence League! Thank you!" I encourage all with even a passing interest in this type of work to sign up for the church's CSL newsletter and become part of this movement! I wanted to say thanks to the Crystal SIlence League and all of those that prayed for me. I'm not one to open up easily about my problems and it was a Godsend to be able to find a church where I felt comfortable asking for a little extra help. Also, reading the other requests helped to remind me that we're not alone in our problems. I encourage everyone to check out this wonderful church. Thanks again for all of the prayers and for all those that shared their prayers. sallybreeze, this was a wonderful post and I thank you for it! I'm very happy to see that you felt comfortable with the CSL way of asking for help with your problems. It is a very nice way for people to not feel so alone with their problems. Thank you for providing us, members and future prayer-requesters, with a review of your experience! I'm glad you feel so good about it! Today I was at the CSL website praying for people, and i saw that the site has received its 1000th prayer today! It is so amazing how the site has taken off, and i'm glad that so many people are using this great church resource. I have been both a sender of prayers, and a recipient of them, and I find it to be a comfort and a blessing. I intend to acquire a crystal ball and become a full member! Here's to many more prayers and many more members of the Crystal Silence League! I wish to share my testimonial and extend my deepest gratitude to the members and friends of the Crystal Silence League and Missionary Independent Spiritual Church. This past August, my husband and I received upsetting news, "out of the blue", about an urgent, erroneous matter that needed our immediate attention and would require favor from out-of-state legal authorities. As my husband got to work rectifying the matter through the proper channels in the mundane world, I got to work on the spiritual end. I prayed for clarity and assistance and a favorable outcome, and I also submitted a prayer request to the church's Crystal Silence League. Immediately I felt calmer and confident that my prayers would be answered favorably. I also prayed for others who'd left prayer requests on the C.S.L. website, and I made sure to click the button to let them know someone had prayed for them. I can't begin to express the comfort and serenity I felt each time I received a notification that someone from the church had read my prayer and had taken the time and effort to pray for us. It feels like a kiss from Heaven, knowing powerful prayer warriors are praying and that my prayer is printed out and placed on the crystal altar of a dedicant of the Crystal Silence League. To supplement all the wonderful prayer work, I requested a Crown of Success candle service at Missionary Independent Spiritual Church and Mother Katrina set the light for me. Thank you, Mother Katrina! I also set my own prayer lights at home and did cleansing and road-opening work. During this time, the main issue was resolved in our favor. Oh, happy day! Relief! But a side issue that popped up as a result of the main issue was still in flux. I continued to pray and set lights and rest in the assurance that the Crystal Silence League was still praying for us. By the time my candle report arrived from church, the side issue had also been resolved in our favor, but Mother Katrina had correctly seen those obstacles that did, indeed, have to be navigated, and thankfully had been cleared in due time. Thank you to the Crystal Silence League prayer warriors and to Mother Katrina at the church, for your help and dedication. I will be forever grateful to you all. Thank you Our Lady of Guadelupe, Archangel Michael, Saint Peter, Saint Barbara, Lord Ganesha and Kwan Yin, my beloved ancestors, and all helpful spirits for your help and protection. What a great first post and testimonial, mockingbird! Thank you so much for the good words! Can I just say that this is such a beautiful idea? Makes me smile just to think of this and the way it encourages caring and inter-connectedness among all people. 1898 - A Boston, Massachusetts periodical, Zion’s Herald, contains a story about a Christmas message from Ian MacLaren (pen name of Rev. John Watson). “IAN MACLAREN,” along with other celebrities, was asked to send a Christmas message to an influential religious weekly in England. He responded by sending the short but striking sentence: “Be pitiful, for every man is fighting a hard battle.” No message is more needed in our days of stress and storm, of selfish striving and merciless competition. Thank you so much for that post, sonsie_lass. I agree with you and share the same feelings towards the CSL. Great story. You're very welcome and I'm glad you enjoyed it! I find myself and my partner in need of prayer. We have been experiencing many difficulties, financial, emotional, spiritual, relationship, and I am concerned someone we both know has crossed us and our relationship. He is having problems with alchohol abuse and we are (have been for some time) fighting tremendously. I feel confused and unable to affect the situation in any positive manner. We both need wisdom, strength, and help with financial luck. Your prayers for both of our well being, wisdom, healing and reconciliation, overcoming his addiction and anger, and financial justice and luck will be very VERY appreciated. We will certainly pray for you. I also recommend that you condense your prayer into about 500 characters and post it at the Crystal Silence League, where it will be printed out by our pastors and by members and set beneath our crystals, to send light and healing. Each time someone prays for you at the Crystal Silence League web site, you will be sent a brief anonymous email telling you that someone prayed. You can upload your prayers daily, if you change the wording as conditions change. 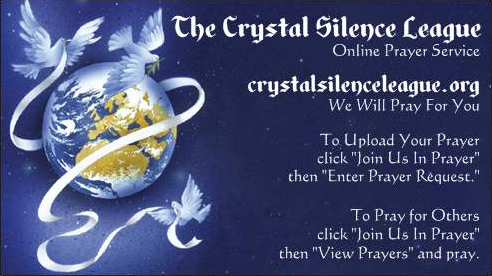 For the past few days, the Crystal Silence League prayer page has been averaging between almost 20 prayers per day -- a great increase over the 7 per day when the site went online 8 months ago. The average over the entire 8 months is now about 15 prayers epr day. I find this remarkable and wonderful. Thanks to you all for posting prayers -- and for taking the time to read and pray for others. Do I need to re-request the same prayer? I was wondering once you send a prayer request and receive confirmation and you've received some emails that someone has prayed for you(I got 4), do you need to or should re-request at some point? I hope I'm making sense.Say if I'm not seeing results for instance or I think I saw a little sign but I'm not sure. If I do not receive anymore emails saying someone prayed for me, are they still praying? I also emailed a picture that I hope was received and is being used. Re: Do I need to re-request the same prayer? Many people post variations on the same prayer request on a regular basis -- as long as the situation needs attention. Nothing wrong with it, as long as you're not taking up pages and pages daily. Once I print out a Crystal Silence prayer request, it's on my altar for a month -- and I know I'm not the only one to do that; so you may not need to post your prayer more than every couple of weeks -- except, perhaps, for emotional relief. 1) Please do not post the exact same cut-and-paste prayer over and over. 2) Please do not "flood" the Crystal Silence League with multiple daily requests for the same need. We have actually had to ban two people who, although no doubt sincere, were posting either cut-and-paste prayers once daily or posting essentially the same prayer over and over up to five or six times per day. I am sure that is not what YOU were proposing to do, but since the subject was broached, i figured i ought to mention it. Actually, posting once a day or once a week is not a problem, as long as you keep in mind that the CSL site is not a mere bulletin board. We are a church and the members of the CSL are prayer-companions on your behalf. When someone has a prayer request to make, they go to the Crystal Silence League prayer requests page. Here they enter the appropriate information. Only the prayer request and first name are publicly posted on the wall. The members of the Crystal Silence League can now offer prayers specifically for that person. A very nice feature is that anyone who sees the public prayer requests can pray for that person and let them know by clicking the button. We send them a brief email letting them know that a prayer has been offered for them. Isn't that a wonderful way to share a bit your time, heart and compassion? We are glad to offer this service and hope that you will share it with anyone you know who could use our prayers. I have one question for requesting prayers. Is it allowed to post for prayer for curses that have been justified and confirmed with an AIRR reader? i don't really want to pressure anyone into praying for a curse but ... when it's justified?? I suppose i'll post my intentions to the CSL site and go from there i guess. if CSL members are willing to pray for these things, i give them my humble thanks. I want to thanks to all of you and want to pray for all of you and my loved ones. I have been on my job for six years. During that time i've passed all of the required exams and requred on the job training thats required for my professional development. I'm the only african american in our shop.My Supervisor seems to have some kind of bias against me. I'm polite, courteous, respectful and hard working at all time. No matter what i do i never get the respect or credit i deserve. I only ask that you pray that he be fair and give me the raises and promotion that i deserve. I've tried everything to try and get him to be fair but just not working. Please pray for me to have more patience , and for him give me everything i deserve. Click on this link to the The Crystal Silence League Online Prayer Request to post a prayer request. Please, pray with me for the most protection, safety and security according to our needs. Please help me to attract the best lawyer for my case. The one who is be most efficacious. Thank you. Blessed Be. Hello. You have posted a prayer in the Lucky Mojo Forum. We maintain a link to the Crystal Silence League as a service to our customers and clients, but this forum is not the Crystal Silence League itself. When you get there, click on Join Us In Prayer, then on Enter Prayer Request, fill out the data-fields (and stay anonymous!) and then submit the prayer. You may upload a picture or description and it will not be seen by the public, only by our pastors. You will receive acknowledgements (anonymously) whenever someone prays for your requat, and you may post your request once a day (but no more please). The Crustal Silence League free prayer chain site has been online for TWO YEARS now. In that span of time, a total of 16,900 prayers have been posted posted. That is 8,450 prayers per year. That is 23 prayers per day! How wonderful it is that we can all take the time to pray for one another. Prayer is a blessing, and my thanks go out to everyone who has posted a prayer or has prayed for a friend or stranger at the site. There's nothing quite so helpful when you're having a rough day than checking your email or phone and seeing that the Crystal Silence League has prayed for you. Blessings on the Crystal Silence League! Thank you all! I am still getting notifications about prayers I posted two years ago. I think it's interesting and wonderful when this happens. I posted prayers for my relatives recently but have no idea if anyone's prayed; no emails have indicated anything. I go out of my way to not abuse the board, but it begs the question: are people flagged for posting too many prayers in any given amount of time? Is one every few months considered "too many"? I've NEVER heard of them EVER refusing any prayers. I am wondering if there was a miscommunication with your e-mail address? Maybe there was a mistake somewhere? PirataPantera, The only times that prayers are flagged is if they are the same prayer over and over again at the same time. Most often this happens because there was a glitch and the same prayer repeats. I know several practitioners and members who pray at CSL every single day (me being one of them). You should definitely be getting emails! Check your account to make sure that your email address is correct and also check your spam folder, it may be the notifications are going there. I actually got an email this week for a prayer I posted back in 2011. Today I got one about the most recent prayer, so my email does indeed work. I'm appreciative either way. It's been over a month since I posted prayers for Magalene who was admitted into the hospital with complications due to cancer, she was released but died shortly thereafter at home. I did not post the notice yet on the CSL board. I wanted to say thank you for a previous prayer I posted about a little boy named Bryson; I truly feel the network helped his injury of a skull fracture...he came through it beautifully like a champ. And as far as I know ,one of the latest individuals I keep a light going for, Jason, who has ALS, is managing the disease better. I would like to submit a prayer request but it says that I my first name will be displayed. Is it absolutely needed? or can I use an alternate name? I have a first name that is not too common and I don't want it displayed. Could you instead use your first initial and your last name? Yes littlebit, you can create a profile with just an initial (or an alternate name that you totally identify with) and that works perfectly! I am just wondering if someone writes prayer requests, they can just be as effective as someone conducting rootwork e.g. candles, mojo bags, spell work? As some of you may have guessed, I'm not having a good time of things recently, what with an ex boyfriend making accusations, not being accepted to do further study at university, trouble at home etc. I have regularly posted to the CSL with prayer requests; not the same thing over and over as this is disrespectful and spamming the boards, but things like asking that good luck be restored to me, any curses broken, the ex to stop making further accusations etc. I am overwhelmed at the response and kindness of others as I regularly get notifications that someone has prayed for me. As reiterated, I have prayed for many things, including recently that I be protected from suicide and depressive thoughts, allegations from the ex. It's hard to know what to take as a sign. My nurse in the community for example who is helping me just now saw me today and has asked to see me next week as well, plus I am seeing the doctor on Friday (protection?). I seriously didn't expect the nurse to offer me an appointment so quickly. Although things are still rocky with my Mother, we aren't arguing as much. And so many people have given me positive affirmations and reassurance not to worry about the police coming after me (the allegations over the ex case). Nony65, prayer has been scientifically proven to help people with healing, improving their lives, find peace, recover from troubles, and so on. Focused prayer is extremely powerful. If you are seeing improvement in your life from prayer than you have answered your own question! Nony65, do not hesitate for a minute to contact the CSL! The support and power generated is AMAZING! Prayer for me is at the epicenter of any working. With others praying, it seems to follow "Two or more gathered in His name..."
This is coming from someone who has asked for back up prayers for workings. paid work they have hired for. Best wishes, and thank you any CSL members who read these forums for all the prayers! I posted here before about still receiving "a dedicant has prayed for you" emails. I find that lately, a lot of the ones I posted years ago are hitting my inbox every day! Can this mean that someone is possibly backlogged and just catching up? I've always been curious about that. I'm getting notices as far back as 2011. I do like I always do and say "thank you" when I read the email, but I do admit I find it odd for some reason. Still grateful, nevertheless! You might want to go to their facebook page and then ask them how to remove your requests from the log. Thank you for all the prayers that I have received but unfortunately my loan application has been rejected, once again. Have you acquired a reading to find out what your obstacles are? I have yet to do so. Do you provide reading too? Yes, most of us do. There's lots of readers to chose from!! When you post a prayer. .what do you do. .and what happens to the prayer. I wanted my dog to win at a competition. So, I sent them a prayer request and gave them his name, the name and date of the competition, and asked them to pray that he wins. Then, the Crystal Silence League prays for you. Each time they pray for you, they will send you an e-mail notifying you of it. I'm not sure if I answered your question but I hope that I did!